In 2019, we have again partnered with Soroptimist International (SI) Branch Geraldton and Midwest Multicultural Association to hold an evening dinner function to celebrate International Women’s Day. 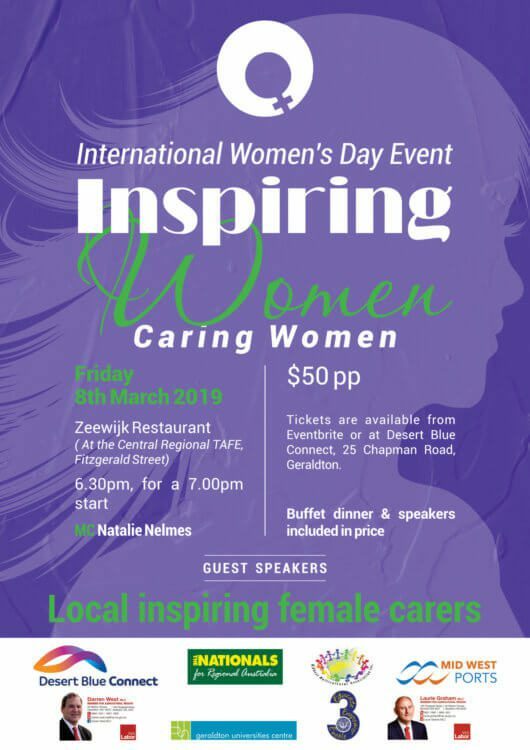 The event “Inspiring Women, Caring Women” will have a focus on women who are carers and the gender imbalance and overrepresentation of women as carers. It is an evening dinner with speakers and will be held at Zeewijk Restaurant, Central Regional TAFE, Geraldton on Friday March 8th 2019 starting at 630pm. ​​​​​​​Desert Blue Connect (previously Women’s Health Resource Centre & Chrysalis Support Services Inc.) have convened an International Women’s Day event in Geraldton every year since 2010. These events have been well attended with the purpose to inspire, celebrate, and connect local women and highlight topics that promote leadership for women. Tickets will be available from 1st February 2019 via reception at Desert Blue Connect and Eventbrite.